Bainbridge Island has an exceptional public school system which is enthusiastically supported by our local community. Millions of dollars are donated annually to our public schools through the Bainbridge Schools Foundation which works to support the district's vision and mission. Enrollment is approximately 300 students per grade, or about 4,000 total enrolled across the district. Bainbridge Island Public School District is comprised of three elementary schools, an intermediate school, a middle school, a high school, and an options program. Ranked #5 in Washingron State and #274 in the nation by US News and World Report in 2016, BHS is located in the center of the island and serves all of the island's high school students. BHS enrollment is approximately 1,200 students across the four grades with most carrying a full course load of six classes each semester. Last year, 42% of BHS seniors received the Washington Honors Award, placing them amongst the top 10% of all graduating seniors in Washington State. Many students are also active in student government and participate in after school team, club, and volunteer activities. A unanimous favorite of Bainbridge Island students, Woodward is named for Walter Woodward and his wife, Mildred, who were the only West Coast newspaper editors to consistently report on the Bainbridge residents of Japanese ancestry who were unlawfully interned in concentration camps during World War II. Woodward is a typical middle school structure where the students move between six different classes each day. The school has approximately 600 students and is next door to Sonoji Sakai Intermediate School. Starting in 5th grade, Bainbridge public school students come together in one school. The 5th-grade classes are made up of two teachers and two classrooms, with the children switching between the two throughout the day. In 6th grade, the students progress to moving between three teachers and three classrooms. This approach prepares the students for a smooth transition to middle school and the challenge of having six different teachers and classrooms starting in 7th grade. A highlight of the year, Sakai's Salmon Program allows students to watch salmon eggs hatch and grow and then, in the spring, the students release hundreds of baby salmon into the stream behind the school. The Commodore programs all value "high parent involvement, student-centered learning, and connections beyond the classroom" embracing the best practices of innovative education. Bainbridge Island has three public elementary schools with about 350 students across five grades in each school. All three schools have an excellent staff of dedicated teachers and support staff who are well loved by our community of students and parents. Each school offers the same specialists for all students: art, library, music, PE, and STEM (science, technology, engineering and math). Parent volunteers are encouraged and appreciated! 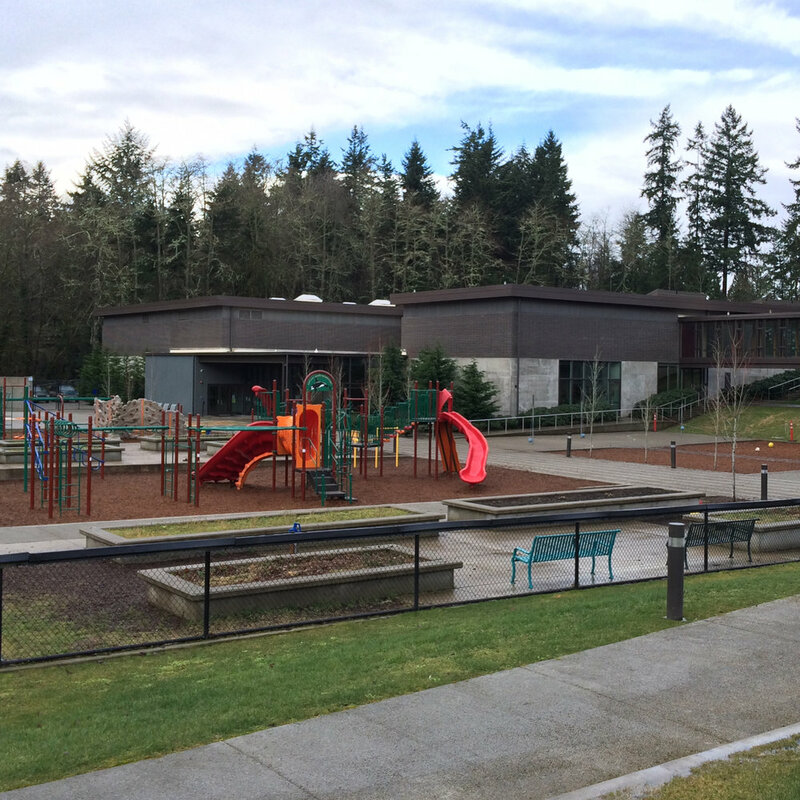 Located on the south end of Bainbridge Island, Blakely serves the elementary school community in the south and mid section of the island. Originally built in 1965, the school has been remodeled and updated several times in the past 50 years. There are plans afoot to build a brand new Blakely from scratch which, similar to the new Wilkes Elementary, is sure to be environmentally friendly and beautiful. Ordway is named for Miss Elizabeth "Lizzy" Ordway, one of the first Bainbridge Island teachers and a superintendent of the Kitsap County Schools dating back to the late 1880s. Built in 1978, Ordway is located near downtown Bainbridge and serves elementary school students who live in the middle of the island . The school's motto, "Caring to Learn, Learning to Care," creates a positive learning environment where children feel safe and valued. The newest school in the district, Wilkes was recently completed, winning the prestigious American Institute of Architects Civic Design award which celebrates the best example of what can be achieved when architects and civic clients work together. It is an extraordinarily beautiful campus serving students who live on the north end of Bainbridge Island.